Recombinant Rubella (strain F-Therien) virus-like particles consisting of spike glycoprotein E1, spike glycoprotein E2 and Capsid protein, produced in mammalian HEK293 cells. Rubella virus-like particles are produced by recombinant expression of Rubella structural polyprotein (amino acids 1-1063, Uniprot accession number NP_062884.1) in HEK293 cells. 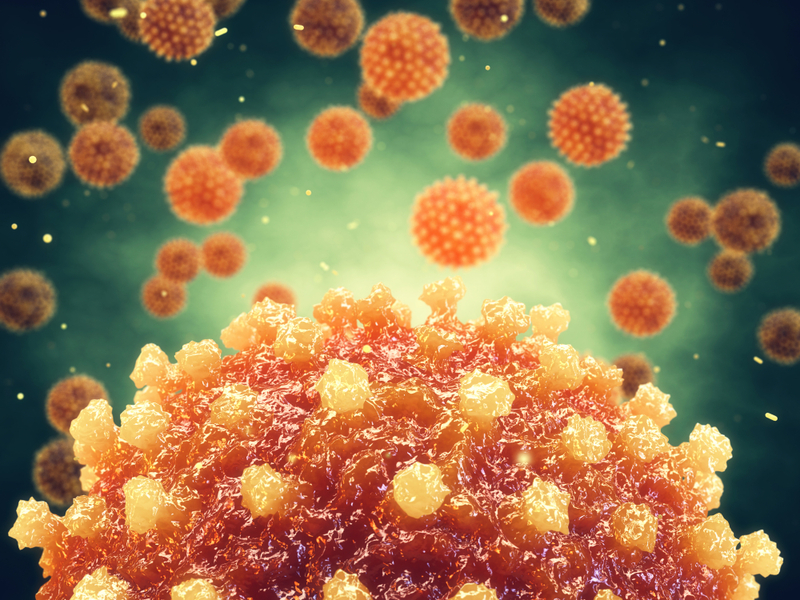 Rubella virus is an enveloped, positive single-stranded RNA virus and a member of the genus Rubivirus, which belongs to the Togaviridae family. It consists of three structural proteins: a capsid protein and two membrane-spanning glycoproteins, E1 and E2, localized in the virus envelope (Oker-Blom, et al., 1983). E1 and E2 exist as a heterodimer and form the viral spike complexes on the virion surface. Formation of an E1-E2 heterodimer is required for transport of E1 out of the endoplasmic reticulum lumen to the Golgi apparatus and plasma membrane (Yang, et al., 1998). E1 is the dominant surface molecule of the virus particle representing the main target for the detection and subsequent elimination of virus by the host’s immune system (Green & Dorsett, 1986; Wolinsky, et al., 1983). 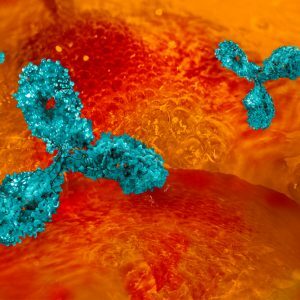 Although both E1 and E2 provide lifelong immunity, hemagglutination (HA) and viral neutralization (VN) is believed to be mainly targeted to E1 protein epitopes (Chaye, et al., 1992). 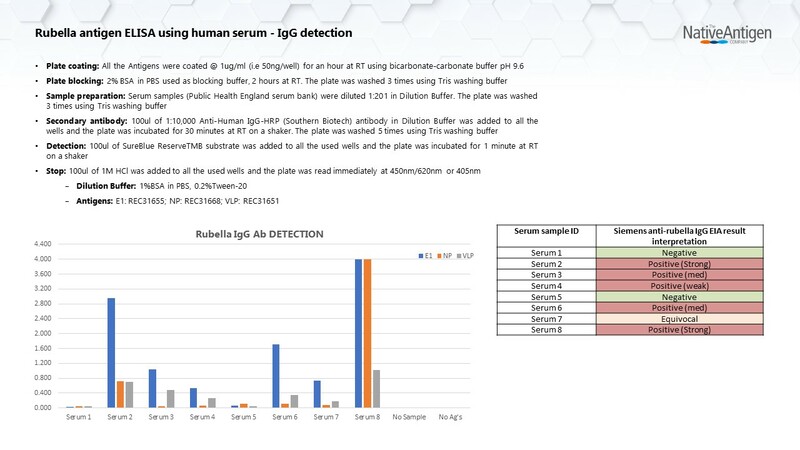 Immunogenicity studies have shown Rubella VLPs to be significantly more active than soluble E1 protein in inducing antibody responses in mice, especially for producing VN and HA-inhibiting activity. 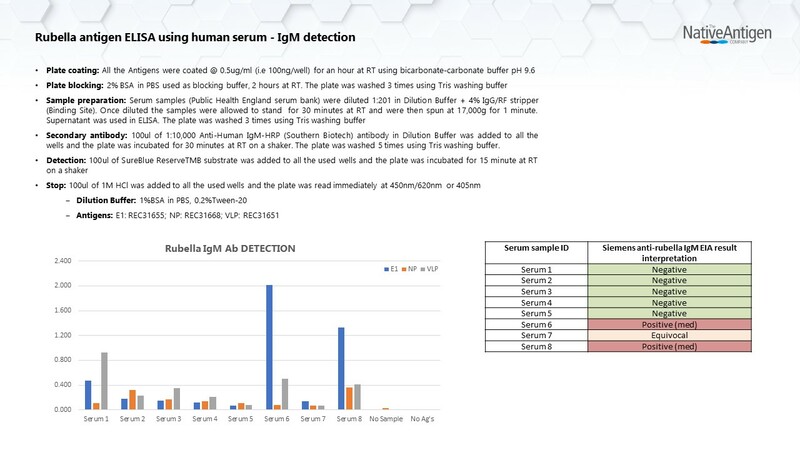 VLPs have also been shown to stimulate cell-mediated immune responses to Rubella virus and Rubella virus structural proteins, which may be important in providing protective immunity against infection. Therefore, VLPs show good potential for safe vaccine development (Qiu, et al., 1994). Chaye, H. et al., 1992. 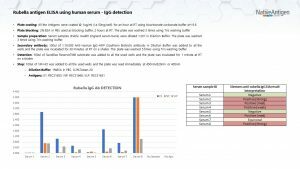 Localization of the virus neutralizing and hemagglutinin epitopes of E1 glycoprotein of rubella virus. Virology , Volume 189, p. 483–492. Green, K. Y. & Dorsett, P. H., 1986. 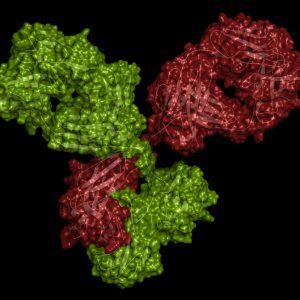 Rubella virus antigens: localization of epitopes involved in hemagglutination and neutralization by using monoclonal antibodies. J. Virol., Volume 57, p. 893–898. Oker-Blom, C., Kalkkinen, N., Kääriäinen, L. & Pettersson, R., 1983. 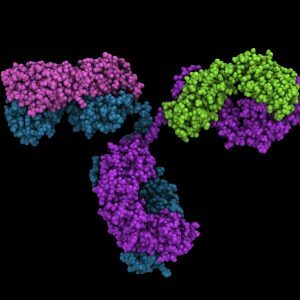 Rubella virus contains one capsid protein and three envelope glycoproteins, E1, E2a, and E2b. J. Virol., Volume 964–973, p. 964–973. Qiu, Z., Ou, D., Hobman, T. C. & Gillam, S., 1994. Expression and characterization of virus-like particles containing rubella virus structural proteins. Journal of Virology, 68(6), pp. 4086-4091. Wolinsky, J. S. et al., 1983. An antibody- and synthetic peptide-defined rubella virus E1 glycoprotein neutralization domain. J. Virol., Volume 67, p. 961–968. Yang, D., Hwang, D., Zhiyong, Q. & Gillam, S., 1998. Effects of Mutations in the Rubella Virus E1 Glycoprotein on E1-E2 Interaction and Membrane Fusion Activity. J Virol., 72(11), p. 8747–8755. 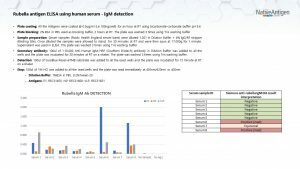 ELISA detection of IgG and IgM antibodies to spike glycoprotein (E1), nucleoprotein (NP) and virus-like particles (VLP) of Rubella virus.